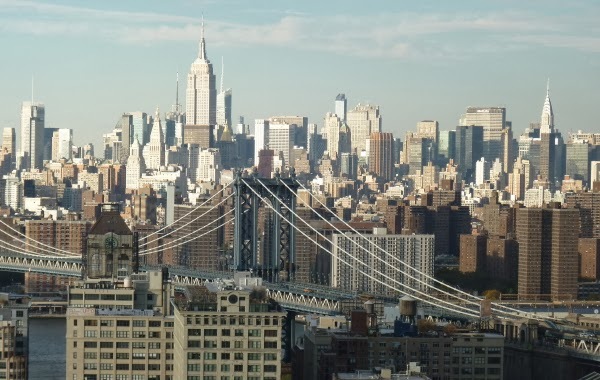 Mayor Bloomberg's failed bridge toll plan (once called "congestion pricing") has come back to life with a "pricing model that might be more palatable to residents outside Manhattan," the NY Times reports. 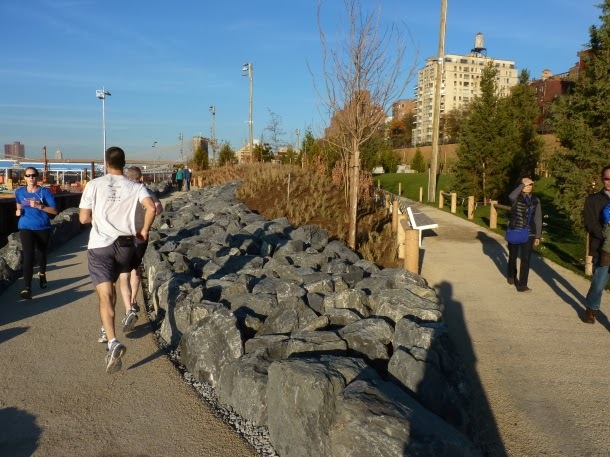 Under the new scheme, Manhattanites would be asked to contribute more than they had under past proposals. An example lists a $5.33 E-ZPass to go over the Brooklyn Bridge. (It's free now.) The one-way rate to cross the Verrazano-Narrows Bridge would decline to $5.66, from $10.66. Backers say that imposing tolls on all the East River bridges would make traffic less congested on those previously-free bridges. We wonder if anyone has taken into account the long lines of slow traffic (and pollution) that would pile up in front of the toll booths? Twitter says it has implemented a new security technology that makes it harder for government intelligence agencies to spy on its users. That's great. Now the only people spying on Twitter users are those who pay Twitter for the privilege of mining the data. And the Library of Congress, which gets it for free. 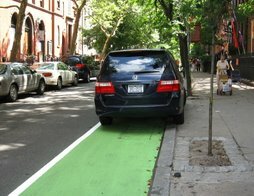 Is DirecTV Responsible for Their Contractor's Unlicensed Driver Mowing Down a Woman in Brooklyn? A DirecTV van ran down a woman in Brooklyn on Monday, leaving her in critical condition. The DirecTV van operated by an unlicensed driver, the NY Daily News reported. DirecTV appears to be trying to wiggle out of responsibility, however. They tweeted, "The driver involved in this unfortunate incident is employed by DTV Alliance, an independent dealer . . . The van is owned by the firm. We been in contact with the dealer to determine how this could have happened." Robert Wright asks the obvious question: "So what steps do U take to make sure your and contractors' drivers don't harm or kill people?" A massive nor'easter, Winter Storm Boreas, is headed for the New York metropolitan area just in time for the two big travel days before Thanksgivng. While most of the news reports focus on Wednesday, Tuesday afternoon's weather is likely to be bad for travel as well. A STORM SYSTEM IS EXPECTED TO TRACK UP THE EAST COAST LATE TUESDAY AFTERNOON THROUGH WEDNESDAY...WITH THE POTENTIAL TO BRING 2 TO 4 INCHES OF RAINFALL TO THE TRI-STATE AREA DURING THIS PERIOD. SOME OF THIS WILL BE HEAVY AT TIMES WITH POSSIBLE FLOODING OF URBAN AND SMALL STREAMS. * WINDS...SOUTH 25 TO 40 MPH WITH GUSTS OF 50 TO 60 MPH. * TIMING...STRONGEST WINDS WILL BE LATE TUESDAY NIGHT INTO WEDNESDAY MORNING. * IMPACTS...POTENTIAL FOR DOWNED TREES...TREE LIMBS AND POWER LINES...CAUSING PROPERTY DAMAGE AND POWER OUTAGES. Stay home if you can! Darndest thing. Now we can't wait to be stuck without a corkscrew. A call came in at 1 a.m. Monday morning that a biker had been hit on Banner Ave. in Coney Island, near the entrance of the west-bound Belt Parkway. The so-called "Knockout Game" that has allegedly reared its ugly head in Brooklyn had negative consequences for an attacker in Michigan. Marvell Weaver, 17, of Lansing, ran into the wrong victim, reports News One. His intended target pulled out his (legal) pistol and shot Weaver twice. Weaver was sentenced one year in jail. The video above also shows several other very disturbing knockout attacks. On Saturday, a man was arrested for a knockout attack in Brooklyn. Amrit Marajh, 28, of Kensington, was charged with charged with assault, harassment and menacing. The Jewish victim was walking down a street in Borough Park, when he said he heard four men talking about knocking him out before hitting him. The four had just left a bar. Three other men were picked up but not charged. Marajh denies he attacked the man, saying his girlfriend is Jewish, according to the NY Post. While the Rev. Al Sharpton spoke out against the “knockout game” on Saturday, Marajh is a name of Indian origin. Marajh is out on $750 bail, according to the New York Times. 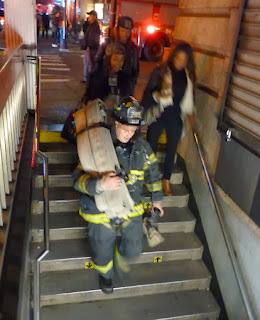 Earlier this evening, at roughly 9:20 p.m., a fire was reported on the north end of the 4 and 5 southbound tracks at Boro Hall in Downtown Brooklyn. Multiple fire engines converged on Court Street near Joralemon and firefighters rushed hoses down the stairs. It appears the situation is over because the 4 and 5 trains are now running on schedule. From the scanner: A hold up was reported at the Chase Bank at 177 Montague Street in Brooklyn Heights Friday night, Nov. 22. The call came in at 10:33 p.m.
Will update if anything else comes in. 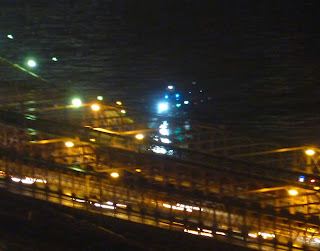 NYPD and the Coast Guard searched the water off the Brooklyn Bridge for a reported jumper Friday night. Word came in that someone had jumped from the roadway of the Brooklyn Bridge into the water off Brooklyn Bridge Park just after 10 p.m.
Three boats, a helicopter and emergency vehicles searched the water. Officers from the 84th Precinct looked for an abandoned car on the Brooklyn Bridge. UPDATE: Police also checked for an abandoned vehicle on the Manhattan Bridge. 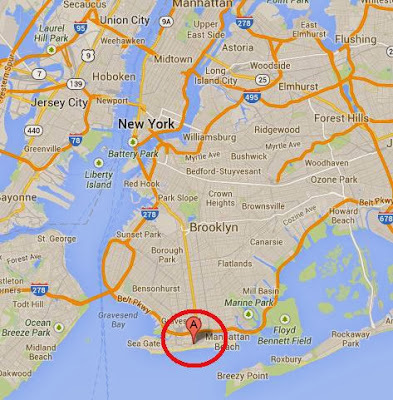 UPDATE 10:25 p.m.: NYPD reports that they can't find anyone in the water. 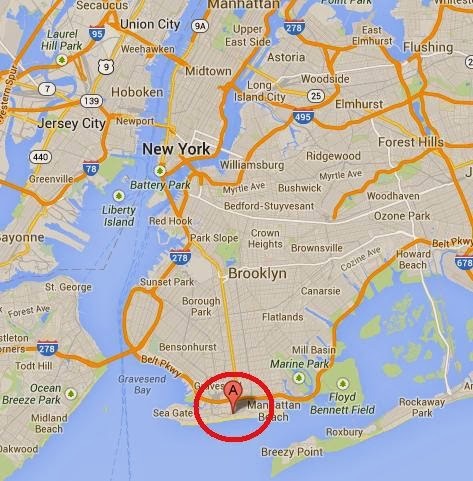 UPDATE 10:28 p.m.: NYPD advises that all searches on water and on land are negative. UPDATE 10:35 p.m.: That's a wrap. A public hearing is planned for tonight -- Thursday, November 21-- at 6 p.m., where New York Methodist Hospital will make a presentation about its application for land use variances for a controversial new ambulatory care facility (Center for Community Health) in Park Slope. The CB6 meeting will be held in the auditorium of the John Jay Educational Campus, 237 Seventh Avenue in Brooklyn. Opponants say the new facility is too big for the historic Brownstone neighborhood, will require the demolition of 16 buildings, and will bring too much traffic. The hospital says it has to build the facility because of market changes, reimbursement cutbacks and the new focus on primary care. Bruce and MaryAnn just want to say thanks. 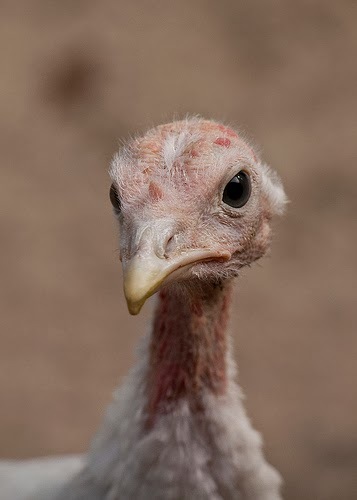 An inexplicable ailment has affected many of the unfortunate creatures known as Butterball turkeys. According to WNBC, Butterball says that it will have a limited supply of large (16 pounds or heavier) turkeys for the holidays this year. The company says the critters just won't plump up in time for Thanksgiving, and it has no idea why. Now they're stuck with a bunch of skinny turkeys. You were this close to buying the $130.3 million Powerball ticket in Brighton Beach ticket this past Saturday. 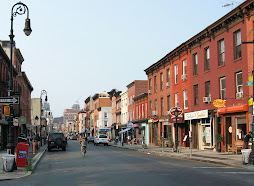 The ticket was sold at Rocco’s Bakery and Deli at 117 Brighton Beach Avenue, Sheepshead Bites reports. According to SB's calculations, if taken as a lump sum the ticket is worth only $73.4 million, with the winner getting about $45.7 million after taxes. So it's not exactly $130 million . . . but that's still a lot of bagels. 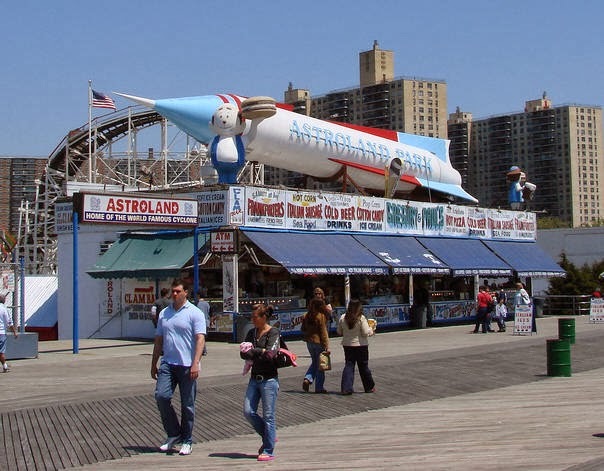 The NYC Economic Development Corporation is looking for an organization to assume ownership of the world-famous, 71 foot-long, 14,000 pound Astroland Amusement Park Rocket Ship ride, fix it up, bring it back to Coney Island, and display it "at a site accessible to the public in a way that enhances the Coney Island visitor experience." Hurry up: The deadline to submit a proposal is November 22. 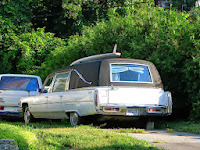 In 2009, the city acquired the iconic ride, which was donated by Carol Hill Albert and Jerry Albert, whose family owned and operated the Astroland Amusement Park from 1962 until its closing in 2008. The Rocket was removed from its perch atop Gregory and Paul’s boardwalk stand and moved to Homeport in Staten Island, a city-owned facility. “This one-of-a-kind Rocket simulator was the very first ride to arrive at Astroland Park when it was founded by my late father in-law Dewey Albert in 1962,” Carol Hill Albert told the EDC in 2009. The Rocket was one of the first space voyage simulators created during the Space Race. Originally built built in 1959 by Todd Shipyards as the "Star Flyer,” it was renamed the Astroland Rocket in 1963 and continued to operate through the 1970’s. The ride had 26 seats and lifted on hydraulics to simulate launching into space. The EDC promised that one day the Rocket would return -- and that day is coming soon. After April 8, 2014, there will be no new security updates or technical updates for Microsoft's venerable Windows XP operating system. 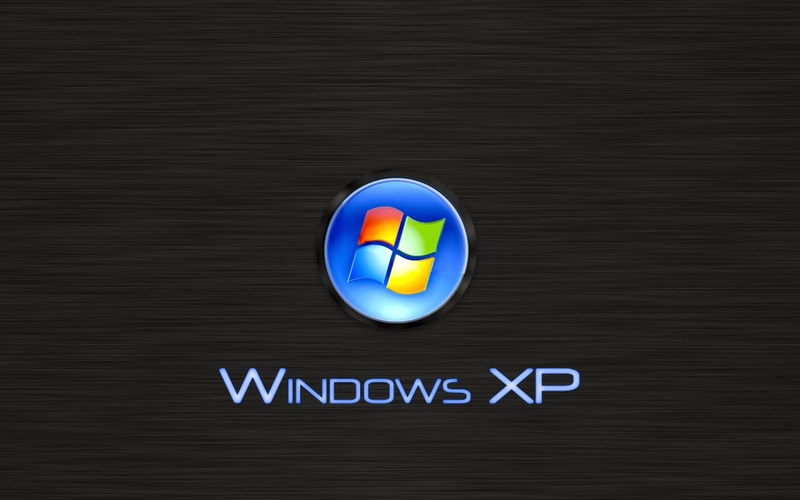 If you keep running XP, Microsoft says your computer will become vulnerable to security risks, and eventually some software may stop working. Unfortunately, when you migrate to a new operating system, some of your old applications may not be compatible. Alas, older computers may not support the newer, memory-hogging operating systems. If you are a big organization and have to migrate a lot of computers, you have to get started right away because it's a glitchy process. Here's some advice for you. If you don't know your operating system, right click on "My Computer" or "Computer," then click on "Properties." 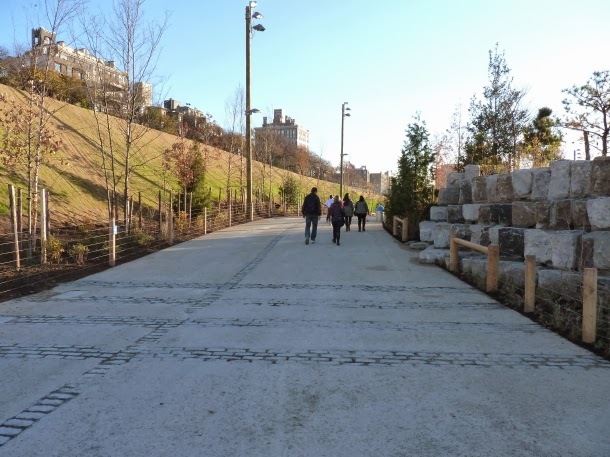 A beautiful new six-acre section of Brooklyn Bridge Park opened over the weekend, upland of Pier 3. Now that it's here, we don't know how we did without it. On Saturday runners made full use of the greenway, above. 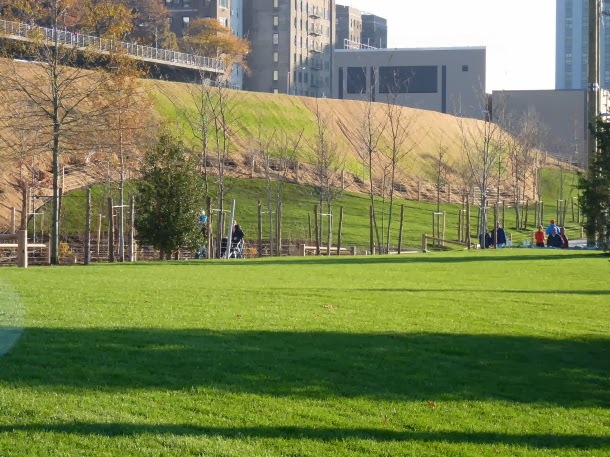 Other sections include lawns and the first of the park’s 30-foot sound attenuating hills. On the right you can see the rear of a granite terrace area. Make sure you climb up there and look around, the views are excellent. Façade repair, Downtown Brooklyn Post Office. 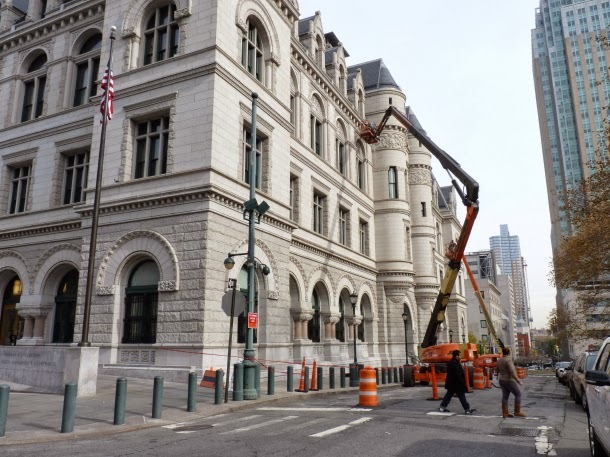 The $62 million façade repair and roof replacement job at the U.S. Post Office and Courthouse, at 271 Cadman Plaza East in Downtown Brooklyn, continues. The contract was awarded to Nicholson & Galloway, Inc. in 2009. 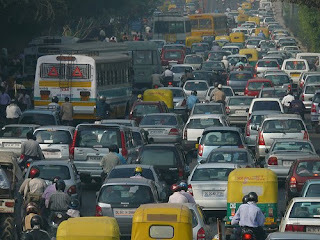 According to government records, the work is now more than 50% done. 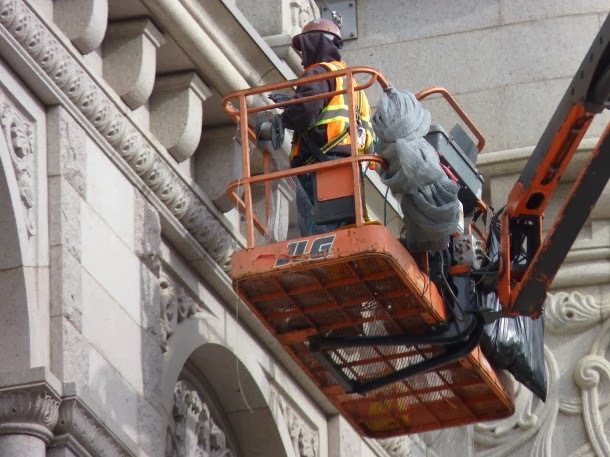 Here's a list of all the contractors and subcontractors, and how much their contracts are worth. NYPD were called in at roughly 3:30 p.m. on Sunday about an EDP (emotionally disturbed person) with a firearm in an apartment building on Lincoln Place between Underhill and Washington, in Prospect Heights, Brooklyn. Police: Suspicious Wired 'Mechanism' on the Brooklyn Bridge Sunday. 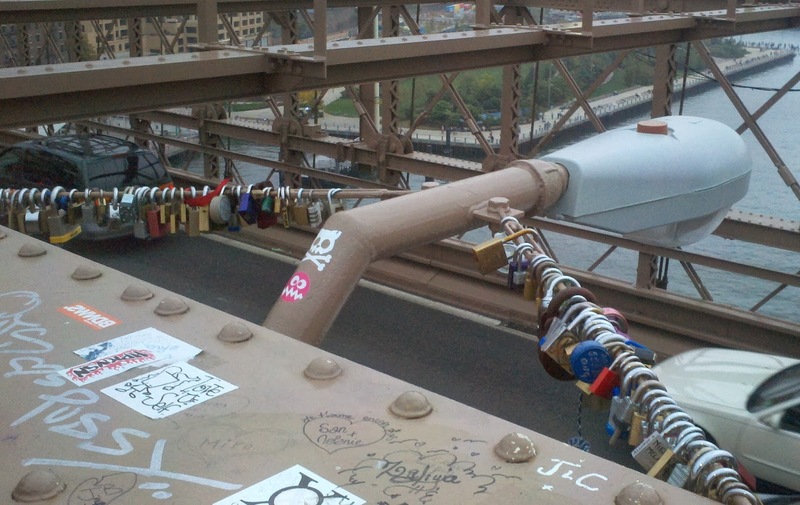 Dangerous Lock of Love? A suspicious package was reported at roughly 3:30 p.m. and again 3:40p.m. on the Brooklyn Bridge Sunday afternoon. The caller reported that a person wearing a backpack and a black hat had left on the bridge a "mechanism the size of a cell phone with wires sticking out of it." Upon questioning, the mysterious person rushed along the bridge walkway towards the Manhattan side. At the same time, in a possibly unrelated incident, a padlock with wires attached to it was discovered by an NYPD officer at around 3:45 p.m.
Could this be a wired Lock of Love? Update at 4:10 p.m.: Officers are walking along the footpath checking this out. The Brooklyn Eagle is reporting that Monday's contempt hearing against the thugs at SUNY has been put on hold for four weeks as LICH stakeholders try to work out a tranition to new operators. 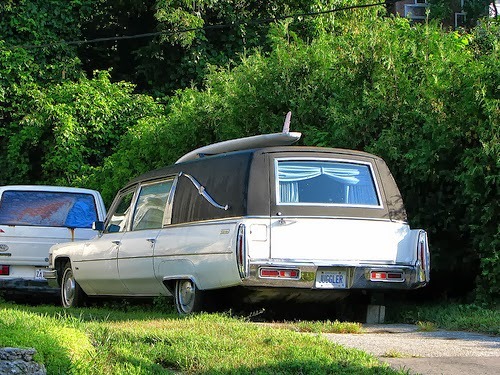 The unwritten rule in the bad old days was that dying intestate (without a will) in Brooklyn could pretty much wipe out your estate. It turns out those bad days never went away. Two employees of the Kings County Public Administrator’s office have been convicted for embezzling $2.6 million from Brooklyn estates, the Eagle reports. That's the office that administers your estate if you don't have a will. Between 2008 and 2011, Richard Paul and Taryn Miller stole $2,617,000 from seven decedents’ estates in Brooklyn. It's a shame it happened, but it reinforces the old advice: Make that will! 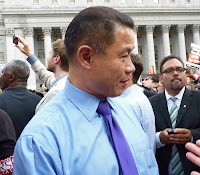 Calling John Liu the "indefatigable" city controller, the NY Daily News describes his normal workaday: Thursday, Liu has fully 10 events on his public schedule. One of his two breakfasts includes a 10:15 a.m. meal with the Caribbean American Chamber of Commerce and Industry in Brooklyn. But he's got events in Manhattan, the Bronx and Queens as well. Could Liu be readying to run for another position after his failed mayoral attempt? Politicker thinks that may be the case. 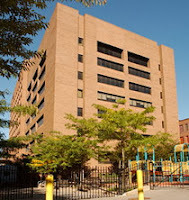 Two threatened Brooklyn hospitals -- Long Island College Hospital (LICH) in Cobble Hill and Interfaith Medical Center in Bed-Stuy -- have hit the headlines today. 20 high-ranking SUNY and DOH administrators, including SUNY's entire board of trustees, have been ordered to appear before Justice Baynes to answer for their actions regarding Long Island College Hospital (LICH). If found guilty of contempt charges, the defendants face “a fine or imprisonment, or both.” Never thought once-respected SUNY would let it come to this. More here. 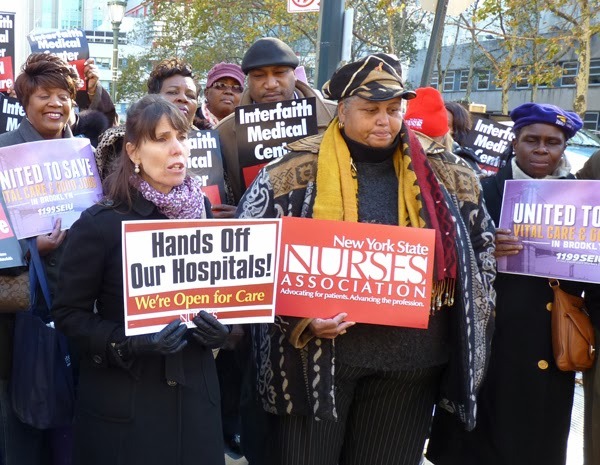 Chief Bankruptcy Judge Carla E. Craig held off on ruling on Interfaith Medical Center’s closure on Wednesday, urging stakeholders to enter into mediation to work out a compromise. This may give stakeholders room to negotiate and possibly line up more serious suitors. More here. "A year after Hurricane Sandy left thousands without homes and basic necessitite, several Brooklyn organizations are holding a reunion for volunteers and donors who came together during those trying times to lend a hand to victims of the hurricane. The reunion is taking place on Tuesday, Nov. 12 from 6pm-9pm at Beth Elohim in Park Slope. Volunteers and donors who gathered in the weeks following the hurricane at Masbia, the John Jay High School and Park Slope Armory shelters, Congregation Beth Elohim, the Sandy Relief Kitchen, and through the Old Stone House and Park Slope Parents will come together to reconnect, reflect and share a dinner catered by the Masbia soup kitchen network that provided over 20,000 hot meals to victims at the Armory throughout their stay. The dinner menu will include foods that have a Sandy connection, such as Tzimmes, a traditional Jewish carrot stew that for logistical reasons became a mainstay in the food served to victims after the hurricane, and a chickpea soup based on a recipe given to Masbia Chef Ruben Diaz by food writer Melissa Clark that is regularly served at the soup kitchen and also during Sandy. All the meat is being donated by Aaron’s Best, the same brand that donated thousands of dollars’ worth of meat for Sandy relief. The program will include artwork from evacuees during their stay at the Park Slope Armory YMCA, music, and a photo slideshow. Starting at 6pm, attendees will have the opportunity to participate in a one hour writing workshop to share their Sandy stories, led by the New York Writers Coalition." UNICEF is rushing emergency supplies to areas of the Philippines ravaged by Super Typhoon Haiyan (AKA: Yolanda) on November 8, as the latest estimates indicate that up to 4 million children could now be affected by the disaster. Death estimates have been as high as 10,000. 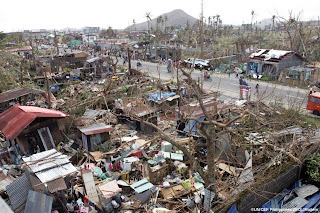 Food for children, health kits, water and hygiene kits to support up to 3,000 families in the affected areas have already been mobilized, with distribution prioritized for the Tacloban area as soon as access is possible. "At roughly 10 a.m. Monday morning, police responded to a 911 call of a suicidal male along the Verrazano Bridge. The man, who had driven a Dodge Caravan Brooklyn bound along the upper level of the bridge, left the vehicle with the hazards lights on and climbed out onto the outer cables. Detective Jeffrey Loughery, Detective Paul Fazio and Police Officer Robert Reed of Emergency Service Squad 5 arrived and suited up in their safety harnesses. Officer Reed began speaking to the individual, who was upset that he could not find a job and provide for his family. Officer Reed then moved out to him until the men were approximately five feet apart. The individual was standing on a ledge with both hands gripped around the cables and turned his body while wrapping his other arm around the cables. Detectives Loughery and Fazio, believing the man was preparing to jump, quickly moved in and secured him with a safety harness and a rescue line. He was then brought to the safety of the roadbed and removed by EMS to Staten Island University North Hospital." 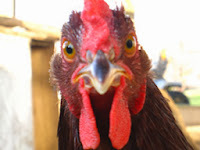 Thank goodness Sen. Chuck Schumer is speaking out against the plan to send U.S.-raised chickens to China, let the Chinese process them into food products, and then ship them back for us to eat. This is the country that is killing our pets with poisoned jerky treats; where people won't let their children play in the cancer-causing yellow air; where tens of thousands of diseased, bloated hog carcasses float in the Huangpu river. China has essentially no food safety rules whatsoever. What does our country say about Schumer's concerns? The USDA says that the senator is overreacting. Motorcycle - Car Collision on BQE Under Brooklyn Heights Promenade Monday p.m.
From the scanner: a collision has taken place on the BQE under the Brooklyn Heights Promenade near the Cadman Plasa West exit. Word came in from dispatch around 6 p.m. Monday. Riders at 126 subway stations — one quarter of the entire system — were unable to buy MetroCards with credit or debit cards at vending machines for hours Thursday morning because of technical problems, the NY Daily News reports. What will riders do when the token booths close? By any definition SUNY Downstate has proven itself to be absolutely INSANE! 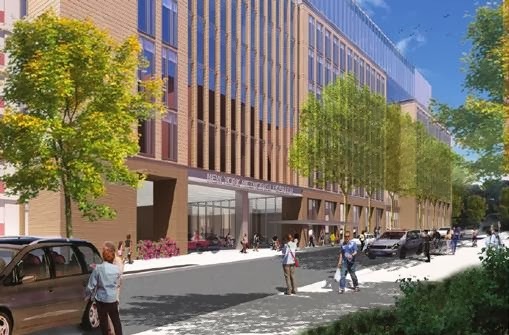 On Wednesday night SUNY said it was halting admissions to Long Island College Hospital (LICH) in Cobble Hill -- AGAIN -- and forbidding ambulances from bringing patients to the ER -- AGAIN. They did this same thing last summer and were ordered to restore services to July 19 levels. They appealed. They lost. A week ago, SUNY threatened to lay off 500 nurses and other employees at LICH -- AGAIN. 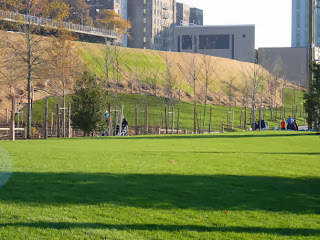 After being threatened with litigation -- AGAIN -- SUNY dropped its threat. Over and over, SUNY had tried the same illegal actions, has been brought to court, and has lost. In the meantime they have drained LICH of patients, doctors and resources and have lost millions and millions of dollars. This is 100 percent, certifiably insane. Got kids? Check out the Hip Tot Music Festival on Sunday November 10th at 11 a.m., featuring a live music concert with Rolie Polie Guacamole. Added bonus: Before the show, kids will enjoy a book reading with Brooklyn's own author/ illustrator Melanie Hope Greenberg, the genius behind "Mermaids On Parade," one of the top five NYC picture books for kids. 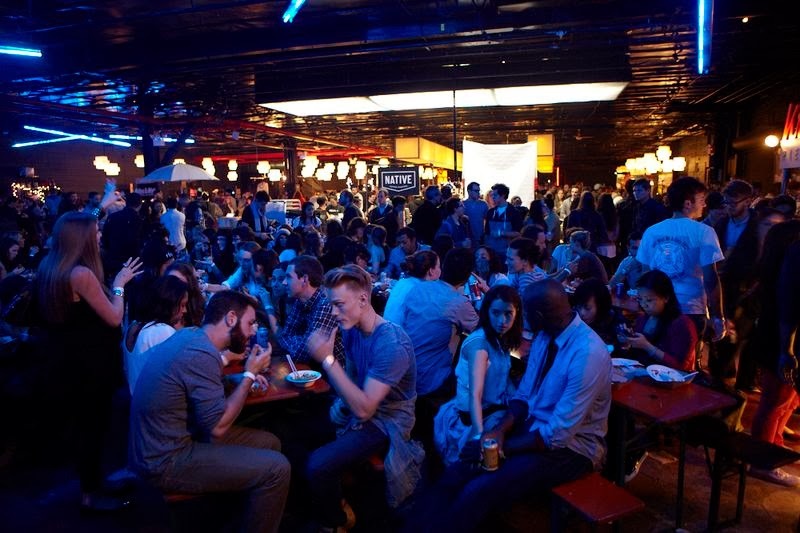 The Brooklyn Night Bazaar kicked off in Greenpoint last weekend with crowds of over 8,000, organizers say. Expect something similar this coming weekend, with performances from The Low Anthem, Robert Ellis and Grandchildren, followed by Lady Lamb the Beekeeper, Ski Lodge and Pearl & The Beard. More than 90 food and artist vendors will be participating. Walk in freezer table tennis and black-light miniature golf are also available for sporting types. It's big and shiny, and we get to look at it but we don't have to live there! 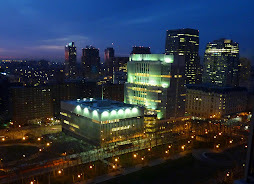 SUNY Downstate has just tonight (Wednesday) ended admissions and banned ambulance service to Long Island College Hospital (LICH), the unfortunate hospital in Cobble Hill, Brooklyn it took over two years ago. A crowd of patients, nurses and other supporters gathered outside the hospital late into the night to talk about the next steps in this debacle, as ambulances stood waiting to haul patients to who knows where. 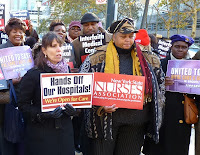 Typical of SUNY to do this kind of thing "in the dead of the night," as nurses told the Brooklyn Eagle. 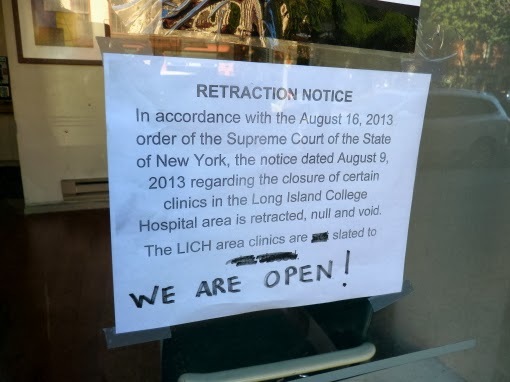 State Supreme Court Justice Johnny Lee Baynes has ordered SUNY -- numerous times -- to keep LICH open to the same degree it was operating on July 19. SUNY has not for a moment taken his orders seriously, even after losing in Appellate Court in October. The last time SUNY banned ambulances at LICH waiti times shot up to 8, 9, or more hours at ERs across Brooklyn, and some people likely died who didn't have to. Bill de Blasio swept the Mayoral race with roughly 74 percent percent of the vote on Tuesday, versus almost 25 percent for Joe Lhota. 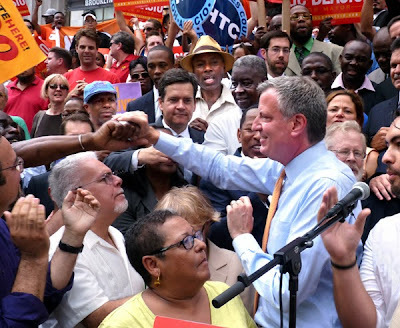 The first Democratic mayor in two decades, voters of every race, age and income level backed him. "Make no mistake: the people of this city have chosen a progressive path, and tonight we set forth on it, together, as one city,” he said in his acceptance speech at the Park Slope Armory. There's a few things you need to know for this Election Day, Tuesday, November 5th. 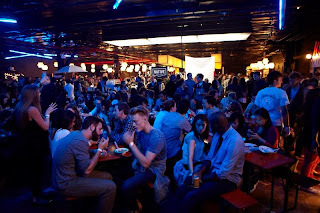 Lastly, for those of you who live anywhere near the Park Slope Armory on 8th Avenue (between 14th and 15th Streets) please be advised that the de Blasio campaign has selected this site for a post-election party. Residents in the area should have received a flyer/letter from the campaign directly. More helpful stuff: Gotham Gazette has published a "Guide for the Last Minute Voter." 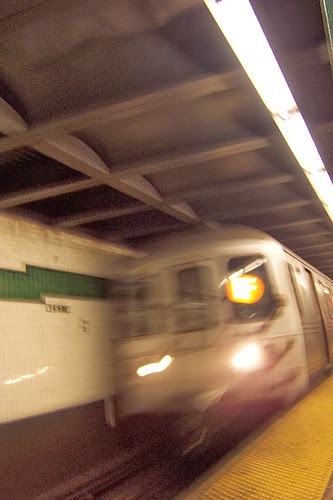 A man was reported on top of Car 95 of a subway train at Church Ave. at about 2:22 a.m. early Tuesday morning. 911 Dispatcher: "Did the person climb on top of the train?" UPDATE: Reported to dispatch at 2:31 a.m.: The F train Queensbound will be powered off. UPDATE 2:32 a.m.: "Individual laying on top of the train. Serious injury. We have FD coming up with a ladder to remove him." UPDATE: 2:34 a.m.: "We have a confirmed body on train, still alive. We're in the process of removing him. Let me know if power is off." UPDATE: 3:04 a.m.: "We're going to have ESU go down and check under the train." 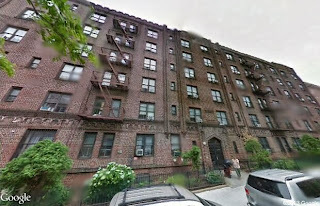 A call came over the scanner at 12:29 a.m. Tuesday morning of 3 or more shots fired at 1670 Pacific Street (near Schenectady) in Brooklyn, about two blocks from Interfaith Medical Center in Bed-Stuy/ Crown Heights. The 911 dispatcher said people were running. At the same time, a call came in reporting 40 -50 teens unruly teens (kicking over garbage cans) on Dean Street heading towards Wyckoff Projects. UPDATE: the unruly teens at 12:35 were reported on Kingston Ave near Park Place, six or seven blocks from where shots were heard. UPDATE: Now at 183 Kingston Ave., across the street from Brower Park. A Brooklyn judge agreed to extend bankruptcy proceedings for Brooklyn's Interfaith Medical Center for a week and a day, until November 13. This may or may not give hospital supporters time to cobble together some sort of solution to its financial mess, the inevitable result of deep Medicaid and Medicare cuts. 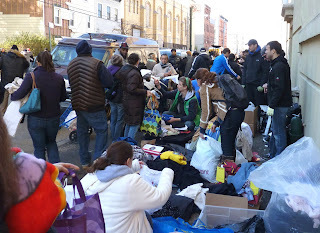 Interfaith serves Bed-Stuy and Crown Heights. While suitors have expressed some interest in the hospital or just its clinics, Chief Bankruptcy Judge Carla E. Craig questioned where the funds would come from while a solution is worked out. “The point here is the passage of time is eroding funds available to implement the orderly closure of the hospital and pay creditors,” she said. Coveted 'I Voted' Sticker for NYC Election is Back! Did you miss out on the "I Voted" stickers they were giving out at polling places during the Primary? Did you, like us, forget to ask for one and then get really bummed out when you saw all your friends wearing them? NYC Votes and the New York City Board of Elections announced today that "I Voted" stickers will again be available at all poll sites in New York City on Tuesday, November 5. Let your friends know you voted by posting a photo of yourself wearing the sticker to social media. NYC Votes will collect photos for the "Voters of New York" photo album. Use the hashtag #IVoteNYC on Twitter, Facebook and Instagram. Interesting factoid: The sticker was designed by Zoe Markman, a 10-year-old Upper East Side resident. Zoe's design featuring the Statue of Liberty won the NYC Vote's #IVoteNYC Sticker Contest this summer. NYC Votes sponsors the city’s official Debate Program and produces the citywide Voter Guide. Manhattan 7 a.m. to n: 6:30 p.m. Note: Access to Museum of Natural History is on West 77th -81st Streets from Columbus Ave.
NYC Public Payphone Map: How Many Are Left? 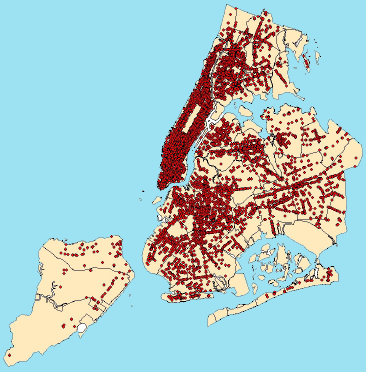 How many public payphones are left in New York City? The city's Independent Budget Office (IBO) put together this map of every payphone in the city, and supplied some interesting numbers as well. In January 2013 there were 11,249 working payphones in public locations citywide, a decline of almost 50 percent since 2008. * The Bronx, Brooklyn, and Staten Island have seen decreases of about 60 percent. * The number of payphones has fallen 33 percent in Manhattan and 52 percent in Queens. "... a distributed sensor network providing real-time and hyper-local records of the city’s rain levels, pollution and other environmental conditions." * The city collects 36 percent of revenue from advertisements on the pay phones. * City revenue from calls has declined steadily since 2008. * City revenue from advertising has increased sharply since 2010. Some discouraging news: A third of families with children in Brooklyn are receiving food stamps (now called SNAP). 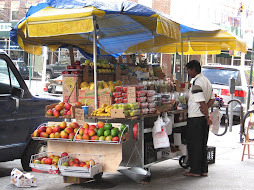 As reported in the Brooklyn Eagle, 56 to 63 percent of families with children in Borough Park and East New York receive food stamps, while in Bedford-Stuyvesant, Flatlands and Sunset Park, 50 –56 percent receive the benefits. 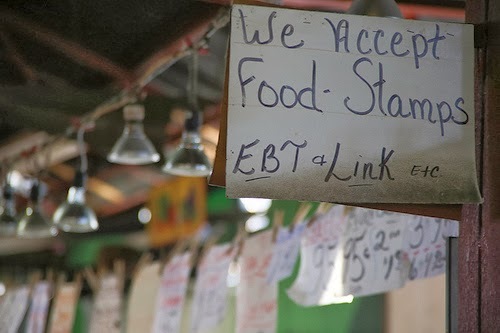 These families are going to have less to eat starting todday, as nationwide food stamp cuts go into effect. Soup kitchens are calling for cash donations. The Empire State Building put on a heck of a light show Halloween night -- with spook classics simulcast on Z100 and KTU. The dancing, animated LEDs were choreographed by lighting designer Marc Brickman to the soundtrack which included "This Is Halloween" and "Ghostbusters." We could see the show from the top of a tall building in Downtown Brooklyn, but if you missed it, hope you enjoy the video.